Product prices and availability are accurate as of 2019-04-18 03:03:20 UTC and are subject to change. Any price and availability information displayed on http://www.amazon.com/ at the time of purchase will apply to the purchase of this product. Reusable Diapers are a really useful and handy product to have in your home if your dog is elderly or is having issues controlling their bowel movements. Using a washable diaper means that your carpets, furniture and house remains as waste free as possible. These diapers can also be used if your dog is in heat! Make sure to check the sizing guide and measure your dog as accurately as possible to get the best fit for your girl or boy! Wegreeco strives to make things that save people money, reduce the amount of trash a family produces. She is on a mission to bring more reusable products into homes by making them practical, beautiful and affordable. The reusable products that wegreeco currently carry are Baby/Dog/Adult cloth diapers,cloth sanitary pads,cloth nursing pads,reusable pail liner etc.When you buy and use a reusable product,you are showing your children how to care for the world they will inherit. The dog diapers a new idea that prevent your dog suffering from excitement urination,incontinence. No matter your pet is in heat, your new puppy isn't house trained yet or your elderly dog is having incontinence issues,our washable reusable dog diaper will keep you, your house and your pet happy. 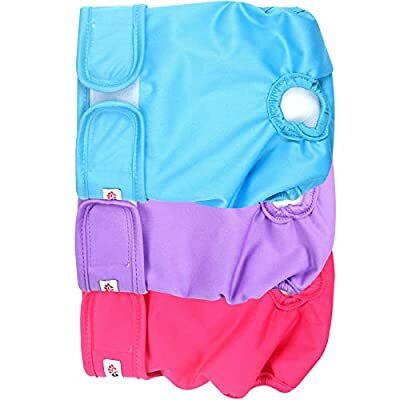 All of our Dog Diapers and Belly Wraps are given to our Pets and Pets Store before production so we know they will hold up to actual use by your pets. Wegreeco take great attention on Quality and durability.All of the diapers are precise stitching and quality interior & exterior fabric makes these diapers for dogs durable and ready to take the abuse of casual wear, accidents, play, and will hold up through numerous washings. Medium: Waist Size 9" to 14"
Large: Waist Size 14" to 20"
Extra Large:Waist Size 19" to 27"
Shop From Wegreeco Without Worry,100% No Risk, Lifetime, Hassle-Free Money Back Guarantee!